The semi-arid Sahel region of Africa experiences some of the most extreme variations of rainfall anywhere on Earth. Persistent poverty, a lack of effective water management infrastructure, and a dependence on rainfed agriculture make the populations of the Sahel particularly vulnerable to rainfall variability and climate change. In my work, I use climate models to study the impact of land-atmosphere coupling on the key atmospheric phenomena that drive Sahel rainfall, and to understand how land-atmosphere interactions may shape the response of these key phenomena to anthropogenic forcing. Among the atmospheric systems I explore are storms known as African easterly waves (AEWs). AEWs not only bring heavy rains critical for agricultural production in West Africa, they also serve as the precursors (sometimes referred to as "seeds") to the most intense hurricanes in the Atlantic Basin and mobilize and transport Saharan dust globally. Though there remains considerable uncertainty in projections of future AEWs and rainfall in the Sahel, we find robust evidence for future AEW intensification along the southern edge of the Sahara as global temperatures rise and local land surface temperature gradients increase. This intensification may increase future dust mobilization and impact Atlantic Basin biogeochemical cycles and tropical cyclone formation. How can we improve the simulation of AEWs in climate models? Will characteristics of AEWs change as global warming continues? Climate models provide a powerful test bed to explore these different questions. Shown in the figure to the right is a composite plot (an average of many different events) of African easterly waves (AEWs) from the National Center for Atmospheric Research (NCAR) Community Climate System Model version 4 (CCSM4) averaged over the years 1980-2005. Green lines represent the flow of air at different vertical levels in the atmosphere. Colored shading represents precipitation anomalies (blue is positive, orange is negative). Skinner CB, Diffenbaugh NS (2014) Projected changes in African easterly wave intensity and track in response to greenhouse forcing. Proceedings of the National Academy of Sciences 111, 6882-6887, doi:10.1073/pnas.1319597111. Six thousand years ago, the present-day Sahara Desert supported widespread vegetation, lakes, animals, and human settlements. Then the rain stopped. Life may have disappeared in just a few centuries. This rainy period in time is referred to as the African Humid Period (AHP). Despite abundant proxy evidence for wet conditions during the AHP, the mechanisms that bring rainfall into the Sahara remain unclear. I use earth system models in combination with paleoclimate proxies such as pollen and lake level data to gain a better understanding of the mechanisms that drive long term rainfall variability in this fascinating and climate-sensitive region of the world. We're interested in using models to study past climates in Africa for several reasons. (1) By taking advantage of paleoclimate proxy records we can test the performance of climate models under boundary conditions that varied beyond the range of recent observations. This provides confidence in these same models' projections of potential future climates. (2) Climate may have played a large role in early human migration out of Africa, and is therefore a critical component for understanding human evolution. (3) The Sahara has a profound influence on global climate. In its current arid state it serves as the low-latitude's largest region of net energy export to space. It is also the Earth's number one source of mineral dust, impacting global terrestrial and oceanic biogeochemical cycles, radiative balance, and tropical cyclogenesis. Understanding climate change in the Sahara gives us insights into climate and ecosystem changes across the globe. In our work, we find that dramatic changes in Saharan rainfall over long time periods are in part driven by changes in the frequency of tropical plume events. These tropical plumes are sometimes referred to as "atmospheric rivers" because of the tremendous amount of moisture they carry. Tropical plumes form when extratropical storm systems over the Mediterranean interact with moisture thousands of kilometers away in equatorial Africa. We find that the transport of this moisture into northern Africa can account for up to 30% of total annual rainfall in the Sahara during the AHP. Changes in the Earth's orbit reduced the frequency of these plumes beginning about 6,000 years ago. In combination with a weakened summer monsoon, Saharan rainfall decreased, vegetation and lakes disappeared, and humans migrated elsewhere. 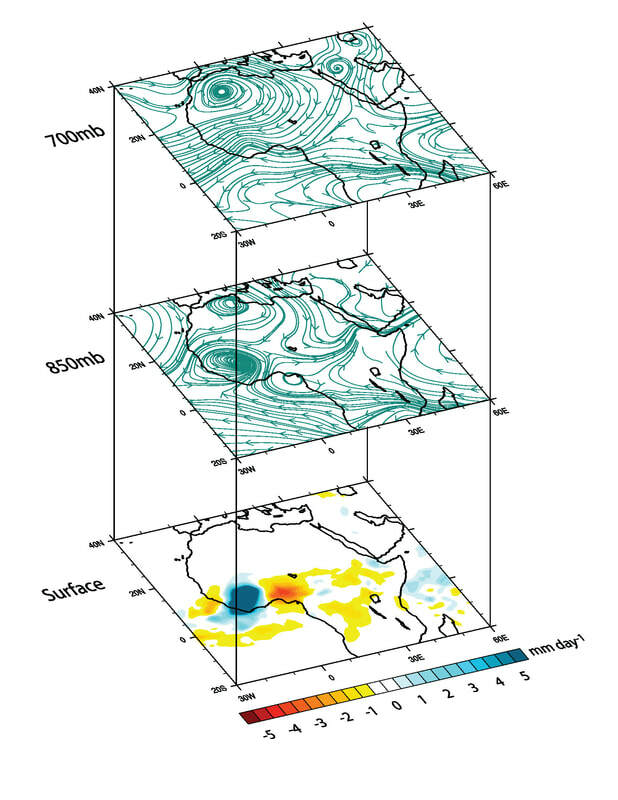 The figure above shows an example of a 4-day tropical plume event as simulated in the Community Earth System Model. What are the physical mechanisms that influence the frequency and intensity of tropical plume events? Is the waxing and waning of tropical plumes with Earth's orbital cycles a global phenomenon? Are there specific proxy observations that support this tropical plume theory? Plants are agents of change in the climate system. By regulating Earth's temperature, atmospheric chemistry, and carbon and hydrologic cycles, plants have had a tremendous influence on the planet's climate history. Given relationships between atmospheric CO2 and photosynthesis, there is strong reason to believe plants will play an active role in shaping Earth's climate changes this century as CO2 rises. In my research, I use earth system models with varying levels of complexity to understand how plant growth and physiology will respond to elevated CO2, and how those responses will influence precipitation and water availability, extreme heat events, and wildfires. As CO2 concentrations rise, observational studies show that plants increase photosynthetic carbon fixation rates and reduce stomatal aperture. As a result, aboveground biomass production increases (CO2 fertilization) and stomatal conductance (the movement of water through the plant) decreases (CO2 physiological forcing). These two changes will have opposing impacts on the climate system: CO2 fertilization should increase plant transpiration and cool the Earth's surface, while CO2 physiological forcing will limit transpiration and warm surface temperatures. Our work using earth system models from the latest IPCC Report shows that CO2 physiological forcing "wins out" over CO2 fertilization in terms of the future impacts on temperature and water cycling. We find that reduced transpiration from physiological forcing increases dry days in the mid-latitudes, heavy rainfall events in the tropics, and heat wave frequency throughout the globe. The figure above displays the climate model-projected end of 21st century change (relative to a preindustrial time) in summer heat wave days from CO2-driven alterations in vegetation growth and physiology alone. The results suggest that high-impact climate events in vegetated regions are especially sensitive to changes in atmospheric CO2. How will increases in biomass and litterfall from CO2 fertilization alter future wildfire characteristics? 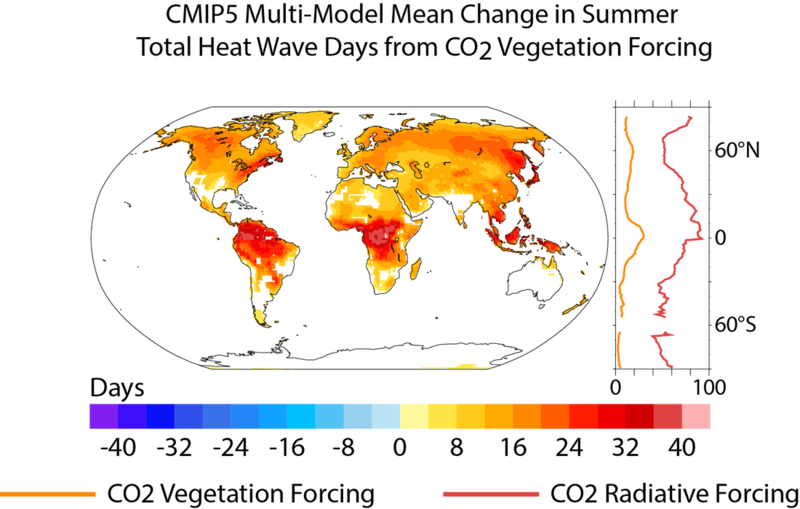 How will changes in biogeography (the movement of vegetation) impact future climate? Will changes in plant physiology, particularly the reductions in stomatal conductance, impact vegetation's role as an ozone sink and a volatile organic compound source? What are the implications for air quality? Skinner CB, Poulsen CJ, Chadwick R, Diffenbaugh NS, Fiorella RP (2017) The role of plant CO2 physiological forcing in shaping future daily-scale precipitation. Journal of Climate, 30, 2319-2340, doi:10.1175/JCLI-D-160603.1. Skinner CB, Poulsen CJ, Mankin JS, (2018) Amplification of heat extremes by plant CO2 physiological forcing. Nature Communications, 9 doi:10.1038/s41467-018-03472-w.